Situated in the middle of our 550 acre beef farm and with stunning views across Tapuaetahi beach is the Bach at Taronui Bay Farm. This property is ideal for two couples or a family. We have one large bedroom upstairs (two singles or one superking bed) and a bedroom downstairs (one queen bed). There is a large open plan living/dining room that leads onto a good sized enclosed deck with exceptional views across the bay to the Cavelli Islands. The bach has a full sized kitchen and a barbecue. Unlimited hi-speed internet is included. The bach nestles in a pretty tropical garden, 50m from the main house. Taronui Beach reserve can be accessed through the farm by vehicle and then on foot along an easy pathway and down through the bush. This beach is wonderful with gorgeous shade from Pohutakawa and perfect swimming for kids as it is quite protected. Across the estuary is Tapuaetahi Beach. Bring a kayak or paddleboard and you can walk across the paddock in front of the bach, launch your craft and paddle across the lagoon at Tapuaetahi. We are a horsey family so if you'd like to bring your horse and ride across the farm, please let us know. The riding is wonderful and we have good horse facilities including a wash down area, small arena and some cross country jumps in one of the paddocks. There is a lot to do in the area, if you love water then there's snorkelling, surfing, kayaking and fishing in and around Taronui Bay Reserve and Tapuaetahi. Not far away is the Waitangi Bike park with wonderful trail riding or you can bike the twin coast cycle trail. A few kms up the road is Marsden Cross and the heritage park and if you bring a boat with you, of course, you have the whole Bay of Islands to explore. We do have a couple of simple rules at the bach. No smoking indoors or on decks, but if you do smoke outside, please be very careful with your cigarette butts because of the risk of fire and please remove the butts. 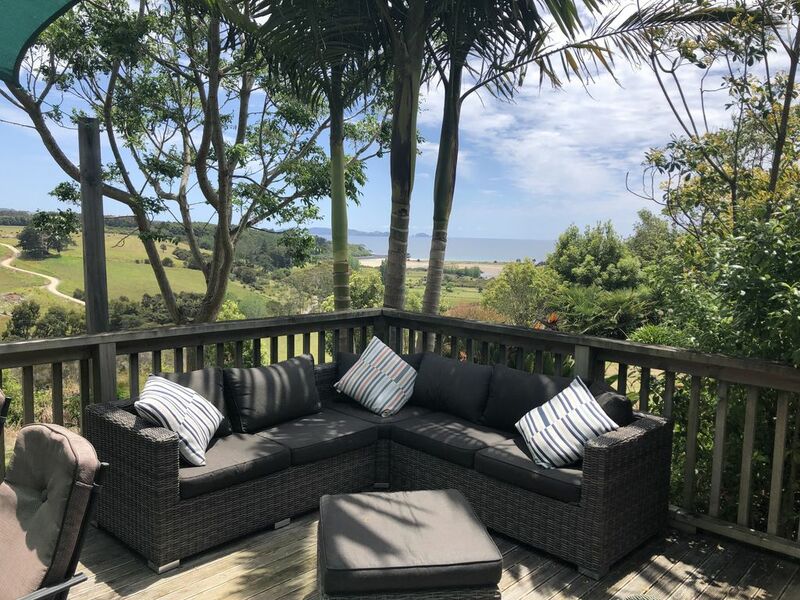 The Bach at Taronui Bay Farm overlooks Tapuaetahi Beach and has access to the more secluded Taronui Beach Reserve. Freeview tv is available and the tv is a smart tv so you can access the internet. We had a great stay in this beautiful spot. Very friendly and helpful hosts. Sam and Rob were very thoughtful hosts and the house (2 br, large lounge, 1 bthrm, sep. toilet) was very pleasant, with great views; a very peaceful environment. Access is by about 1.5 km of metal road across farmland; access to the DOC Taronui beach is by another metal road up a v. steep hill (5 minutes) and then a short walk (15 mins); my family loved that beach. The estuary, lagoon and beach in view is only accessible by kayak (25 mins. ), but Rob provided one kayak and showed us the river bank below steepish bush where we could launch it (10 min walk from house). Kerikeri is only 15 mins by car, and the Marsden Cross reserve and beach 20 mins drive + 40 minutes walk in the opposite direction. Overall a wonderful stay, so long as you don't need easy beach access. There are so many activities to be enjoyed from here ! If you love the water, there's snorkelling and swimming at Taronui Bay or Tapuaetahi, and surfing in the right conditions, as well as great fishing off the rocks. Bring paddle boards or kayaks and you can launch them in the estuary that meanders through the middle of the farm and paddle all the way to Tapuaetahi Beach. Bring a boat with you and you can access the beautiful Bay of Islands. If you love biking you can bring your own bike or hire a bike and nail the trails at Waitangi Bike park or cycle the Twin Coast Cycle Trail. We are just up the road from Marsden Cross and Rangihoua Heritage Park which is a wonderful walk and fascinating insight into the events that shaped the arrival of pakeha to New Zealand.